Perhaps no other publicly traded company suffered as much ignominy in 2018 as Facebook (NASDAQ:FB). Up until last spring, almost everyone revered FB stock. First and foremost, the social-media firm dominated its core industry. Further, it continued to disrupt its rivals in the space, along with other unrelated ventures. 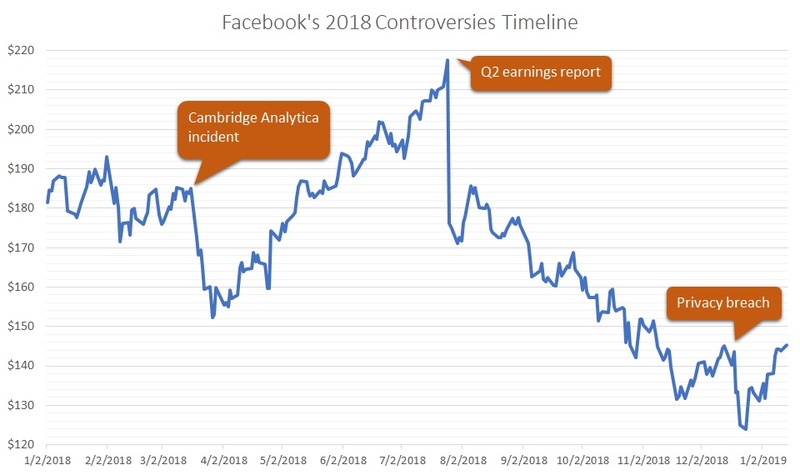 But then the mainstream media reported on the Cambridge Analytica debacle, curbing the momentum in Facebook stock. In a nutshell, FB inadvertently allowed a politically motivated data-research firm to exploit subscriber information without their knowledge. The optics were especially controversial because Cambridge Analytica may have helped President Trump’s electoral campaign. Fast forward a few months, and FB stock was back on its record-breaking ways. But that too met an unsightly end. Management released its earnings results for the second quarter, which on paper didn’t meet Wall Street’s lofty expectations. Shares absorbed an ugly beatdown from which they have yet to recover. As if things weren’t already bad enough, The New York Times brought to the public another embarrassing gaffe. This time, FB may have facilitated major companies such as Netflix (NASDAQ:NFLX), Spotify (NYSE:SPOT), Microsoft (NASDAQ:MSFT) and Amazon (NASDAQ:AMZN) to breach various privacy protocols. These violations include allowing companies to read private messages. When reading about Facebook stock, we’re mostly surrounded with negative hyperbole. That’s quite understandable considering the circumstances. But from a contrarian perspective, this setting represents the ideal time to pick up shares. I’d approach this situation by asking the opposite question: would you sell FB stock at this time? While that approach is tempting, it may also lead to a big mistake. It’s very likely that most, if not all of the bad news is already baked in. Plus, Fortune 500 companies with multi-billion dollar businesses tend to overcome their controversies. My best example is Equifax (NYSE:EFX). In the fall of 2017, EFX stock tumbled when the credit-monitoring agency admitted compromising millions of social security numbers. If any organization deserved indefinite moral outrage, it’s Equifax. But discount last year’s market meltdown, and you have a tremendously viable controversy play. From trough to peak, EFX gained over 50%. I’ve used the Equifax argument a few times before because I wrote about the subject. However, other examples of consumer-related controversies exist, including Target’s (NYSE:TGT) data breach. Home Depot (NYSE:HD) suffered a similar breach. In both cases, their respective stocks eventually moved higher from the controversy. When the Cambridge Analytica story made headlines, the fallout hurt Facebook stock. After trudging largely sideways in the first few months of 2018, shares took a decidedly negative trajectory around mid-March. Shares lost about 16% before climbing back up. After the “disappointing” results from its Q2 earnings report, FB stock took an uppercut to the chin. In one fell swoop, the once-universally loved social-media firm dropped 19%. Worse yet, it sparked a string of bearishness from which the bulls have not effectively responded. So when Facebook was hit with another controversy — this time, the not-so-private messages debacle — it was old news. In my opinion, the American public grew tired about hearing the same old thing. They got the message: Facebook is a controversial company. That’s not to say that Wall Street didn’t punish the organization because they did. However, the magnitude was yawn-inspiring. The day after the NYT expose, Facebook stock slipped over 7%. Looking at the incident’s peak-to-trough metric, shares lost almost 14%. But the company has already recovered those losses. That tells me that the bad news is baked in. More importantly, investors are ready to hear a new (bullish) narrative. When I invest, I avoid focusing on any one metric. Due to the dynamic investment sector, as well as the legal games that management can play with their books, certain fundamental indicators are vulnerable to misinterpretation. One of those is the price-to-earnings ratio. Often times, you’ll hear inexperienced investors talk about a low P/E ratio being “good,” and a high P/E being “bad.” At the end of the day, these are just accounting terms. They don’t have moral postures, nor do they necessarily imply an accurate assessment. For instance, a low P/E suggests that a company is undervalued. But it could also mean that the company’s business stinks, and therefore, it can’t attract investors at any price. On the flipside, a high P/E doesn’t always mean overvalued. For instance, a high-flying tech firm may lever an innovative product. Investors see the potential, and are willing to pay a rich premium against its earnings. What we have with FB stock is a dominant organization that fell under hard times. Admittedly, management brought the troubles to themselves. However, it has a fairly straightforward path to redemption. Look, Equifax compromised most of today’s working Americans for the rest of their lives! Unlike credit cards, the process for getting a new social security number is complex. If people can forgive the unforgivable, they can certainly give a pass to FB stock. Usually, social-media platforms cater toward a specific audience. For example, Snap (NYSE:SNAP) tilts significantly toward the youth demographic. Twitter (NYSE:TWTR) appeals to celebrities, businesses and the most-important office in the world. But the beauty of Facebook is that the platform covers all angles. If you’re on social media, this is the one account you must create. Whether you’re an individual, a non-profit organization or the White House, almost everybody has a Facebook account. This advantage lends unprecedented credibility for FB stock. Thanks to its two-billion plus subscribers, management doesn’t need to impress anyone. The harsh reality is that if you want anything done, Facebook represents your best bet. Therefore, you can expect the advertising dollars to continue rolling in. Moreover, the company is not going to lose this critical moat. As we shift further away from analog mechanisms, FB has increased its relevancy. For instance, if I want to find out more about an event or organization, I’ll peruse Facebook. This is their public face, so it’s sure to contain updates and pertinent information. Many people add to their Amazon holdings because the e-commerce giant is relentless. They don’t want to merely dominate their own industry. Increasingly, and to the annoyance of soon-to-be competitors, Amazon has targeted other sectors. So if it’s disruption that you love, you should really check out FB stock. Within social media, management has addressed its youth vulnerability through its Instagram acquisition. The photo-sharing app has spiked in popularity, and is biting into Snapchat’s market share. Another opportunity is in sports streaming. Several contenders have thrown their names into the arena, but Facebook again has the most credibility. Because it has such a massive global reach, management can stream multiple sports leagues for various regional markets. Last summer, Facebook bought the rights to stream La Liga football (soccer) games in India and several neighboring countries. The move makes perfect sense. Just in India alone, Facebook levers 270 million users. That’s more subs than Snap has globally. The bottom line: Facebook owns social media. Now, it’s ready to disrupt and dominate other markets. 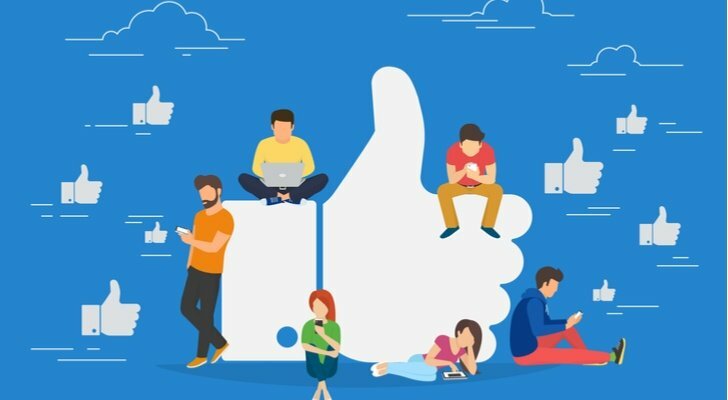 Article printed from InvestorPlace Media, https://investorplace.com/2019/01/reasons-why-you-need-to-buy-facebook-stock-at-this-price/.